“Dead Space: Extraction” is a prime example of a prequel done right. The original “Dead Space” was an instant hit. With it’s almost excessive gore, stunning visual quality and almost perfect atmospheric soundtrack, the game was a masterpiece. Now, the series is back for the second time with this gruesome rail shooter prequel. It’s time to go back in time to the beginning of the entire massacre and take a look at what really happened before the events of the original game. 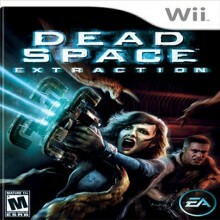 Ladies and gentlemen, gear up and hop aboard for a trip through the terrifying world of “Dead Space: Extraction”, exclusive for the Nintendo Wii. As far as the Wii goes, the graphics in this game are stunning. While the lighting, shadows and overall texture quality won’t match that of the PC, Xbox 360 or PlayStation 3 versions of the original game, the developers did a fantastic job of bringing the game to life with the limited hardware capabilities of the Nintendo Wii. This is as realistic as it gets given the circumstances and it’s sure to scare the heck out of almost anyone at some point or another. Dismembered limbs, plenty of blood, a slick digital interface and plenty of jumpy moments fill this jam-packed game DVD. Sound quality surely isn’t far behind. Superb voice acting is noticeable even during the very first scene of the game and does not degrade in quality as the game moves forward. Of course, no horror-themed video game would be complete without a terrifying and atmospheric soundtrack. Thankfully, this game delivers all of that and so much more. Every creek, gun shot, moan and even footstep is brought to life, waiting for the right moment to unleash another terrifying collaboration of game elements upon the player. As good as this game is, it wont be stealing the overall series spotlight at all. Why? Well, it’s a rail shooter. Not only that, but for a $50 game, it’s a bit short. So, what’s so awesome about this game? First of all, the controls are as good as it gets for a rail shooter. Aiming the Wiimote is just as precise as any well-calibrated arcade light gun and the general control layout for weapon switching, alternate fire and interacting with the environment is extremely simplified. Everything is a simple point and click design, aside from the alternate fire of each weapon, which is performed by tilting the Wiimote sideways. Otherwise, the nunchuck stick is used to switch weapons, while the touch of a button will utilize the stasis ability, reload or fire the equipped weapon. With that in mind, the game is very challenging on higher difficulty settings, no matter how much of a rail shooter veteran you may be. Upon unlocking the higher difficulty settings, the game goes from moderately difficult to almost impossible without a fully upgraded set of weapons. On that note, the challenge does keep the game fresh for a while, but it’s not enough to stop the game from falling into the trap of extreme repetition. The entire game revolves around shooting a handful of different enemies and a few fairly cool bosses, but that’s only fun for so long when you’re only capable of controlling the cursor on the screen. Still, there’s a ton of stuff to work for, should you choose to play the game long-term. Playthroughs of each level are scored using a 5 star system. If you perform perfectly, you’ll earn a 5 star rank. In order to unlock everything, you’ll need to clear each level, find every item, obtain all upgrades and avoid taking damage as much as possible. It will likely take quite a long time to master the entire game. But again, repetition soon settles in and generally puts a stop to any remaining interest in the game. All told, though, this is a great game that tells a gruesome tale. If you’ve played the original game, this game is even better due to the fact that the story is a direct prequel to the events of the original game. However, let it be known that this game holds it’s own. It is not necessary to play or complete the original game to fully enjoy this prequel. That said, this game rocks. Overall, with a bit of skepticism, I was honestly not sure what to expect of the final product. I’m left feeling very satisfied and I definitely can’t wait for the next game in the series, be it a rail shooter or otherwise. -Wide selection of difficulty settings. -Plenty of things to find and unlock. -While the story is cool, it lacks real substance. If you’re a fan of horror-themed games and you own a Wii, you owe it to yourself to check this game out. If you’ve played the original game, there should be nothing stopping you from picking this game up. For those with weak stomachs and anyone who gets scared very easily, this game definitely is not for you. Everyone else, check it out, but make sure you try before you buy!